FLAGSTAFF, Ariz. (AP) — Deb Haaland is not the first Native American woman to run for Congress, but she could be one of the first elected Tuesday. More than 100 Native Americans are seeking seats in Congress, governor’s offices, state legislatures and other posts across the country in what political observers say has been a record number of candidates. The uptick comes amid the #MeToo movement and as President Donald Trump’s administration has taken stances that many tribes say are attacks on their status as sovereign nations. “The Native folks on the ballot are getting lots of support, and I think that speaks volumes for our country,” said Haaland, a member of Laguna Pueblo in New Mexico. Mark Trahant, editor of Indian Country Today, has been tracking the names largely through crowdsourcing. On Election Day, he will co-host a program focusing on the Native American candidates that will be broadcast online, and on television and radio. “It’s needed because nobody’s ever done it before,” said Trahant, of the Shoshone-Bannock Tribe in Idaho. Native Americans make up about 2 percent of the U.S. population but often are underrepresented in political office. Congress has two Republican representatives: Markwayne Mullin, Cherokee, and Tom Cole, Chickasaw, from Oklahoma. Both are seeking re-election. In New Mexico, Haaland has outraised her opponent in a congressional district that is considered safe for Democrats. Republican Yvette Herrell, a member of the Cherokee Nation, is in a hotly contested race for an open seat in a southern New Mexico district. Herrell’s campaign spokesman, Rob Burgess, said she hasn’t made being Cherokee a focus of her campaign because she wants the race to be about the issues, rather than her heritage. Democrat Sharice Davids, a member of the Ho-Chunk Nation, is a formidable challenge to a vulnerable four-term incumbent for a congressional seat in Kansas. A win by any of them would put a Native American woman in Congress for the first time. Haaland said she’d be proud to have that designation to ensure the country recognizes the inequities tribes face, and the fight they’ve been waging for decades for fishing, land, water and voting rights, and protections for Native women from violence. She knows it won’t be easy. The U.S. Interior Department under Trump recently reversed a decision to hold land in trust for a Massachusetts tribe. And many tribes say recent characterizations of tribes as a race, rather than political nations, in a federal court in Texas and by the U.S. Department of Health and Human Services undermine their sovereignty. 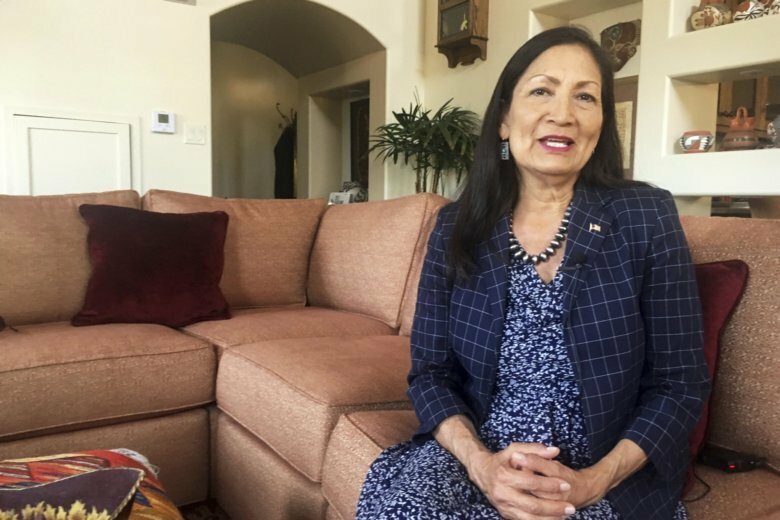 If elected, Haaland said she would not waste opportunities to “impart some knowledge, some history, some perspective on any of my colleagues,” and make sure tribal leaders are heard. In statewide races, Minnesota will have its first Native American lieutenant governor. The candidates, Peggy Flanagan and Donna Bergstrom, both are members of tribal nations that are bands of Ojibwe. Coeur d’Alene tribal member Paulette Jordan is seeking to become Idaho’s first Native American governor. Though she has generated excitement, especially among Idaho’s younger voters, the state’s overwhelmingly conservative population means the numbers likely won’t fall in her favor. Trahant will be joined by Antonia Gonzales, anchor and producer of public radio program National Native News, to broadcast the results. They partnered with California-based TV network First Nations Experience and Native Voice One, both of which are geared toward covering indigenous issues. Micah Wright, executive in charge of the television network, said pre-election testing highlighted another challenge in Indian Country — staying connected with reporters who will be sending in results. He said one person who tried to phone in couldn’t because a tribe had blocked Skype believing it slowed service. “Taking on something this ambitious is a risk and, at the same time, it’s a risk worth doing,” said Wright, of the Muscogee (Creek) Nation of Oklahoma.